This isn’t a park, but a really good parking place for starting on three trails. This webpage describes getting on those three tails and it is also an opportunity to talk about the encroachment of trees in front of places that were once intended (and still described) as having a view. _____On a map, the Summit House Restaurant is on Fullerton Parks Department land. Hopefully, the city is taking in pretty good rent. (That restaurant looks like they charge a lot.) 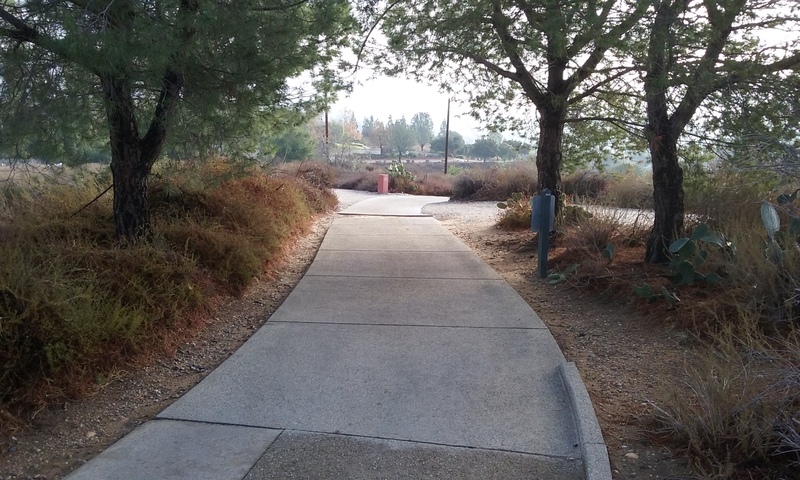 There is an arrangement where the public can use their parking lot to go on city trails. There is even a Fullerton Park within what appears to be the grounds of the restaurant; tiny Vista Park. Vista Park, however, does not connect to any trail and in fact the park is so small its maintenance has been given over to the restaurant as is any arrangement for formal use such as a wedding. All three trails described here are accessible from the restaurant’s parking upper lot. The Summit Restaurant parking lot can be entered from either State College or Bastanchury. There’s a very large parking lot uphill from the restaurant. Park at the extreme north end. Look for a large gate west of the parking lot. That gate should be open after 6:30 AM. Just past the gate you will see a tee-off green for Hole 3 of the Coyote Hills Golf Course. There are signs that direct you to the Panorama Trail. Along the way there are several very wide trails away from the main trail. They lead to more private property; either the oil company or the golf course. Although private property, exploring a short ways is probably OK. Certainly it would be expensive of them to police it. Just keep in mind that golfers spend up to $94 to play. Where they tee off on hole 3 is very close to where you are OK to be. Further up is hole 7 which may be the most spectacular, hole in Orange County. To see them tee off there means 50 feet or so away from the Panorama trail but you will be walking through trees which will mask your misdemeanor. If no golfers are there, go to the edge and check out that drive. The hole is as much down as it is far. So steep is this course, the golf course management doesn’t even allow golfers to walk it, let alone us poor folk. Click here to see the golf course layout. A bit further west (and a bit more in altitude) are the two very prominent observing places. This view is the climax of a trail described elsewhere in this website. (See Panorama Trail) Alas, trees have grown up to block the view of Mt. Baldy and any where east. Continue on for about a third of a mile through the preserve. 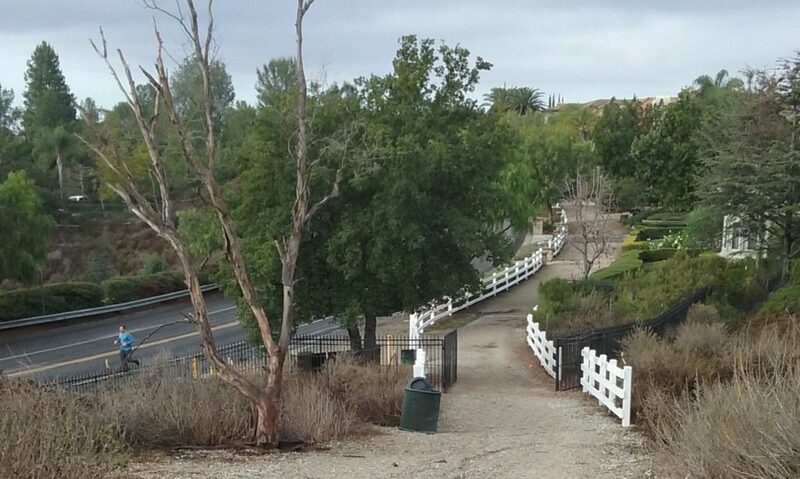 You will emerge onto a gravel sidewalk next to Ladera Vista Drive. It’s pretty easy to find your way on the road downhill. 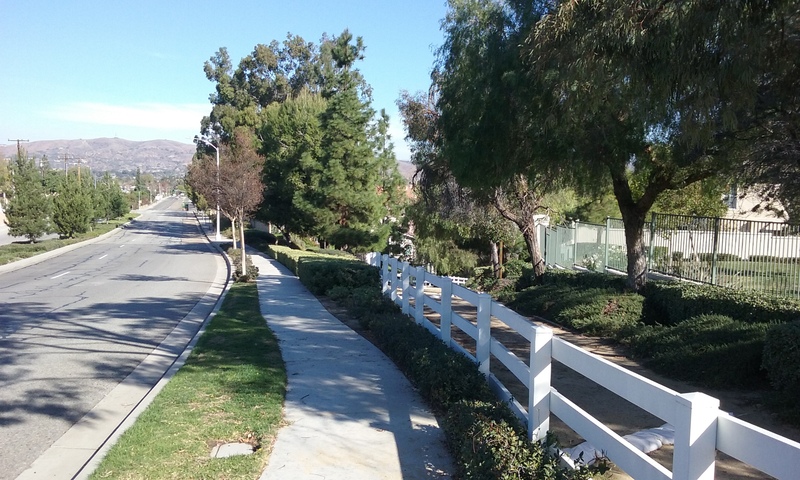 (Ladera Vista turns in to Skyline Drive, then to go downhill turn right on Ridgetop Ln.) The road comes to an end but the trail goes down into a ravine. On the way to the bottom there’s golf course to the right and homes of rich people on the left. Continuing uphill on the other side of the ravine the trail will then curve to the right where you will pass the Little League Park on Brea Blvd. Out and back to that point is 3.0 miles. ____Of course you can continue walking north on the side of Brea Blvd. That becomes East Coyote Hills Trail and it turns right at Bastanchury and completes a loop at the Summit House Restaurant. That loop is fairly well known to bikers who are less concerned with the noise of the street and the rocks to walk on. It is the same distance as the more scenic out and back at the Little League Park. This is looking toward restaurant,. The trail to the left is the one to East Coyote Hills Trail. From the Summit House Restaurant parking lot, the easiest way to the East Coyote Hills Trail (the trail on Bastanchury) is directly from the parking lot. Just walk down there either on the drive way or through the landscaping. The side trail that goes down hill north from Panorama to East Coyote Hills Trail. There are sign posts to reassure you, you are on the right path between the oil wells. 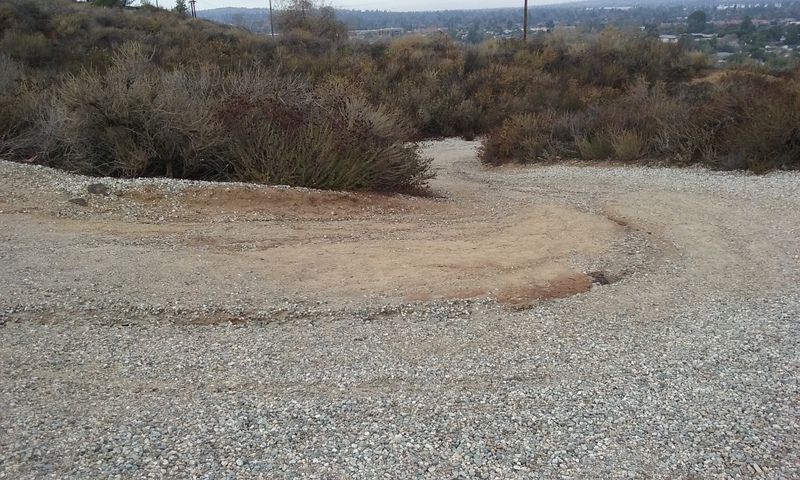 When you reach the East Coyote Hills Trial the paths merge going east. Make a hair pin turn and take The East Coyote Hills Trail down hill (west) for almost a mile along Bastanchury. Our goal is where the golfers park their BMWs. There a restaurant there. Prices are surprisingly affordable at $9 to $12 for lunch. Out and back to this point is 1.3 miles. Longer journeys are described in the webpage East Coyote Hills Trail. This is where the trail along State College peel off to the right into Craig Park. 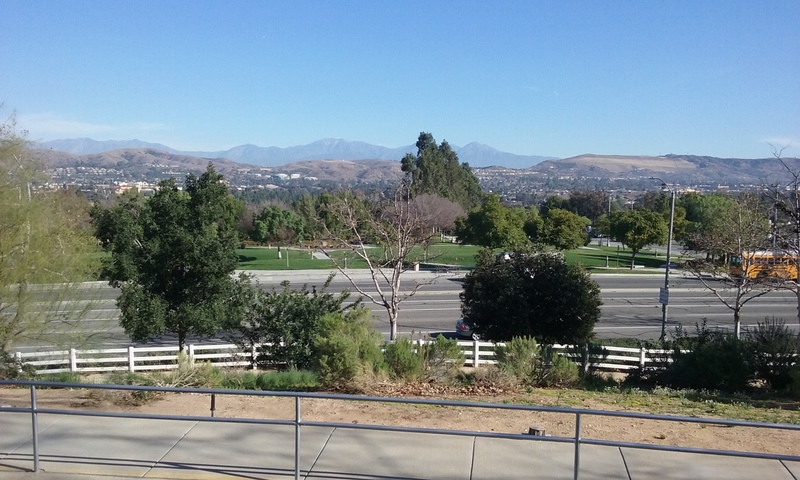 Craig Park is the largest most attended county park in North Orange County. It is north east of Summit House Restaurant parking lot. Walk directly from the parking lot down to Bastanchury, or through the restaurant’s front landscaping to the corner of Bastanchury and State College. Cross Bastanchury and check out the view from Mountain View Park on the north west corner. (Not much is it. Once again the only reason to have a park there has be destroyed by trees that have completely blocked the view.) Cross State College to the trail that goes down (north) along State College. Walk another 1/2 mile. You can’t miss the trail that leads into the park. It is another 900 feet into the park where the dirt becomes concrete trail, a sidewalk, that is like the paths throughout the park. Yes this is an official way into the park which is free for walkers. For more on this trail into Craig Park, and the trails to take within the park, go to the webpage Craig Park. You can of course bring your own picnic but if you continue your walk (half mile or so) north through the park just a hundred yards past the main entrance is “The Hat” famous for their pastrami sandwich. Carl’s, Cocos and all of nice restaurants of Brea Mall are a block or two beyond The Hat. 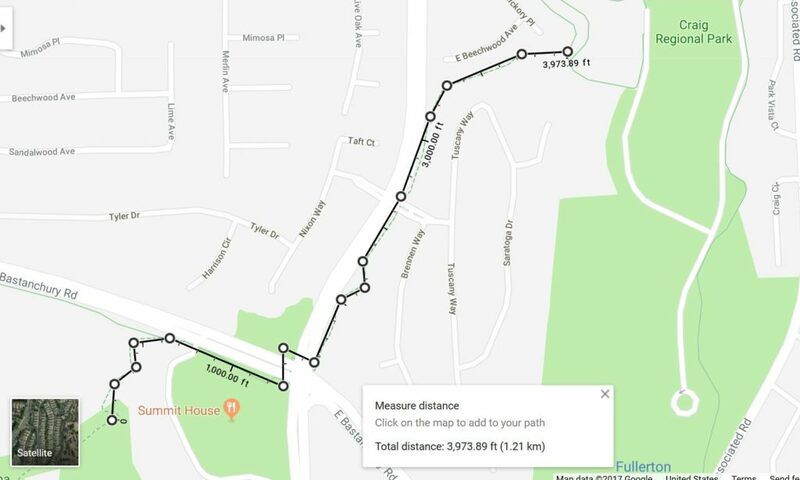 The round trip distance is 3.2 miles. This so called park is so close to the restaurant, so much a part of its grounds, one would never consider coming to this park unless you are rich and waiting for your reservation. It’s only uniqueness maybe that it is lit at night and you can go there at night and pretend you are rich. This park is an odd duck. It may have been a deal struck between the restaurant and the Parks Department. 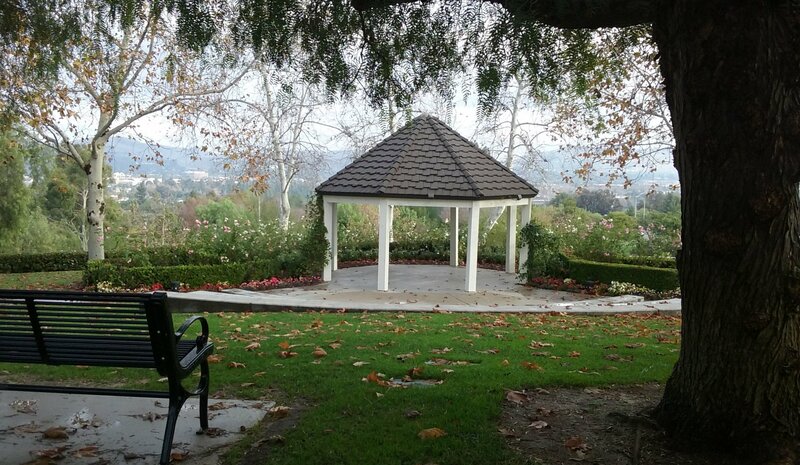 It is something of a gazebo with a place for an audience. Its primary purpose however has evolved to the restaurant hosting extremely expensive weddings, ($30,00 or more). It doesn’t have a view anymore because the rose bushes have grown up; but then who cares. There is a sidewalk that goes around the gazebo and then around the restaurant itself. For visitors to the park (when there isn’t a wedding going on) who are wheelchair bound, this trail is not to be missed. The sidewalk is about .2 of a mile around with lots of places to stop for a view; night or day. Yes there are picturesque lights all the way around. but at night the spectacular view is the cityscape on the south side of the restaurant. 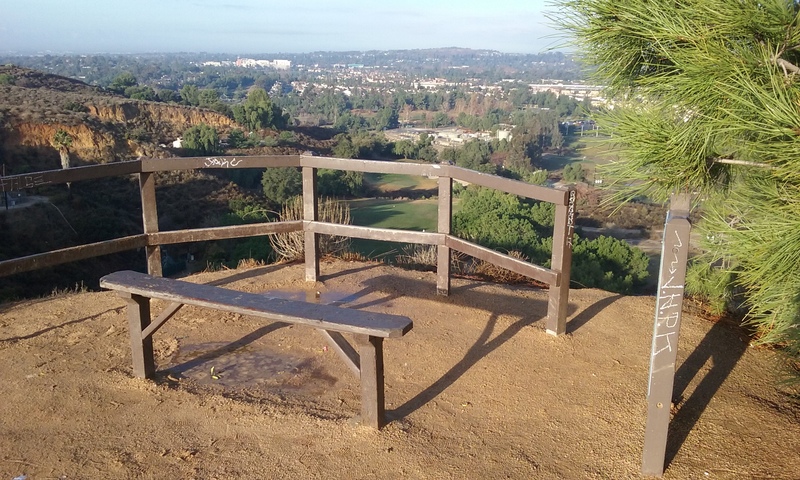 It was mentioned above about the two view spots on the Panorama Trail that have their view of Mt. Baldy blocked by trees. 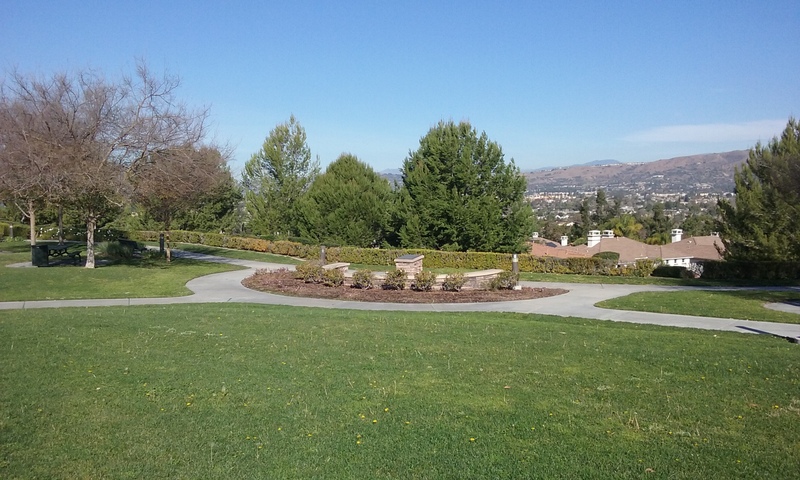 The inappropriately named Mountain View Park has similarly been compromised. But there is a place about 50 feet to the right and below the gazebo. It is the view the audience to the gazebo had before the shrubs and trees dominated the local landscape. But even this spot will be overgrown by landscaping in a few years so go there now while there is still something of a view. This is what the golf carts run on and in some places shared with walkers for a few feet. A leaning rail is very reassuring when looking down into the golf course. This and the other high place have the view to the north east blocked by trees. 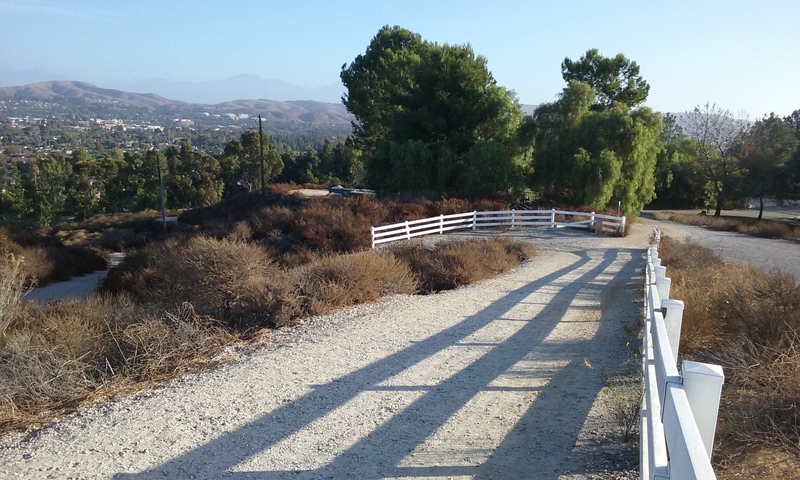 This view is from the scenic vantage points looking west where the dirt trail merges with Ladera Vista Street. Across Bastanchury is Mountain View Park. Here again we see how the trees have encroached in on the view. This is the only place with a view to the north east. It is down below the gazebo of Vista Park where the street dominates the view. Map from Summit Restaurant Parking lot to Craig Park. Place holder for when I can figure out how to panorama this scene. It is the view that Vista Park had before all the shrubs and trees grew up.